Yes, I copied the idea of this outfit from last year's spring J. Crew catalog. I admit it. However, imitation is the sincerest form of flattery and if something is good, why not copy it and make it your own? Originally, I styled this skirt for spring/summer in a post entitled I'll Take a Rain Check. Last week I decided to take a page out of the J. 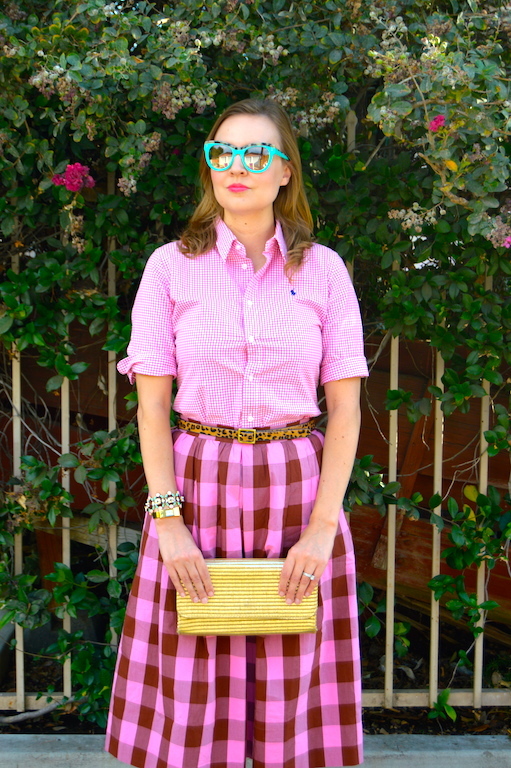 Crew catalog and pair the skirt with a smaller scale pink gingham shirt. Even though I'm a copy cat, I did add some of my own touches. In other words, I like to think that I've put my own signature "Hello Katie Girl" stamp on the look. I tried to accomplish this with the leopard accent of my belt and shoes, not to mention what I like to think have become my signature pair of teal sunglasses. Have you ever copied something straight from the pages of a catalog or I am the only one caught red handed plagiarizing a look? I knew I can trust on you for fun and vibrant outfits. Love the double plaid!! Such a pretty combo! Love love love it! Love this look! the little and bog check combo is so great and the colors are gorge! You're seriously a pattern mixing queen! I do try and copy from magazines and Pinterest inspiration, and it usually helps push me a little outside of my comfort zone, which is good! You can definitely rock a pink outfit! I really like the leopard print with the pink! It really makes the whole outfit pop and brings in a different color/pattern without it being bold! Oh, I absolutely copy outfits directly from catalogs, pins, and tv shows! This is a great look, I love how colorful and bold it is. This is definitely worth, copying. I love the two different scales of the gingham print together, especially since they are on the same color family. That clutch, shoes and your bracelets/watch are so beautiful. Inspired by this look!! I can always count on you for the ideas!